Writing for Spiegel Online, Christoph Reuter explains how the Islamic State established itself in Syria’s conflict, using the secret files of the Iraqi commander — a former colonel in the intelligence service of Saddam Hussein’s air defense force — who implemented the strategic plan. *The commander Samir Abd Muhammad al-Khlifawi, known as Haji Bakr, established a small unit in Tal Rifaat in Aleppo Province in late 2012 and “sketched out the structure of the Islamic State, all the way down to the local level, compiled lists relating to the gradual infiltration of villages, and determined who would oversee whom”. *Military camps were quickly set up for foreign fighters — by fall 2013, Islamic State files listed 2,650 in Aleppo Province alone — as “absolutely loyal troops” who “knew nobody outside of their comrades, had no reason to show mercy and could be quickly deployed to many different places”. *Haji Bakr’s strategy was implemented effectively for the Islamic State takeover of the provincial capital of Raqqa, captured from the regime in February 2013, by October of that year. However, three months later, the strategic planner was dead, killed as fighting broke out between rebels and the military group he had developed. In fact, not even those who shot and killed him after a brief firefight in the town of Tal Rifaat on a January morning in 2014 knew the true identity of the tall man in his late fifties. 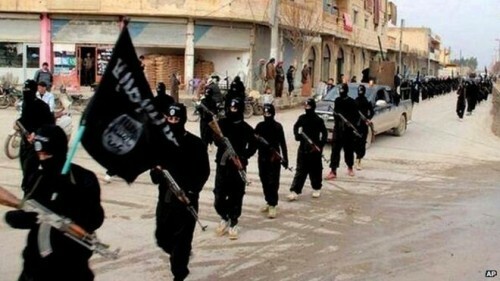 They were unaware that they had killed the strategic head of the group calling itself “Islamic State” (IS). The fact that this could have happened at all was the result of a rare but fatal miscalculation by the brilliant planner. The local rebels placed the body into a refrigerator, in which they intended to bury him. Only later, when they realized how important the man was, did they lift his body out again. But when the architect of the Islamic State died, he left something behind that he had intended to keep strictly confidential: the blueprint for this state. It is a folder full of handwritten organizational charts, lists and schedules, which describe how a country can be gradually subjugated. SPIEGEL has gained exclusive access to the 31 pages, some consisting of several pages pasted together. They reveal a multi-layered composition and directives for action, some already tested and others newly devised for the anarchical situation in Syria’s rebel-held territories. In a sense, the documents are the source code of the most successful terrorist army in recent history. Until now, much of the information about IS has come from fighters who had defected and data sets from the IS internal administration seized in Baghdad. But none of this offered an explanation for the group’s meteoric rise to prominence, before air strikes in the late summer of 2014 put a stop to its triumphal march. For the first time, the Haji Bakr documents now make it possible to reach conclusions on how the IS leadership is organized and what role former officials in the government of ex-dictator Saddam Hussein play in it. Above all, however, they show how the takeover in northern Syria was planned, making the group’s later advances into Iraq possible in the first place. In addition, months of research undertaken by SPIEGEL in Syria, as well as other newly discovered records, exclusive to SPIEGEL, show that Haji Bakr’s instructions were carried out meticulously. Bakr’s documents were long hidden in a tiny addition to a house in embattled northern Syria. Reports of their existence were first made by an eyewitness who had seen them in Haji Bakr’s house shortly after his death. In April 2014, a single page from the file was smuggled to Turkey, where SPIEGEL was able to examine it for the first time. It only became possible to reach Tal Rifaat to evaluate the entire set of handwritten papers in November 2014. “Our greatest concern was that these plans could fall into the wrong hands and would never have become known,” said the man who has been storing Haji Bakr’s notes after pulling them out from under a tall stack of boxes and blankets. The man, fearing the IS death squads, wishes to remain anonymous. The story of this collection of documents begins at a time when few had yet heard of the “Islamic State.” When Iraqi national Haji Bakr traveled to Syria as part of a tiny advance party in late 2012, he had a seemingly absurd plan: IS would capture as much territory as possible in Syria. Then, using Syria as a beachhead, it would invade Iraq. Bakr took up residence in an inconspicuous house in Tal Rifaat, north of Aleppo. The town was a good choice. In the 1980s, many of its residents had gone to work in the Gulf nations, especially Saudi Arabia. When they returned, some brought along radical convictions and contacts. In 2013, Tal Rifaat would become IS’ stronghold in Aleppo Province, with hundreds of fighters stationed there. It was there that the “Lord of the Shadows,” as some called him, sketched out the structure of the Islamic State, all the way down to the local level, compiled lists relating to the gradual infiltration of villages and determined who would oversee whom. Using a ballpoint pen, he drew the chains of command in the security apparatus on stationery. Though presumably a coincidence, the stationery was from the Syrian Defense Ministry and bore the letterhead of the department in charge of accommodations and furniture. What Bakr put on paper, page by page, with carefully outlined boxes for individual responsibilities, was nothing less than a blueprint for a takeover. It was not a manifesto of faith, but a technically precise plan for an “Islamic Intelligence State” — a caliphate run by an organization that resembled East Germany’s notorious Stasi domestic intelligence agency. *Name the powerful individuals in these families. *Find out their sources of income. *Name names and the sizes of (rebel) brigades in the village. *Find out the names of their leaders, who controls the brigades and their political orientation. *Find out their illegal activities (according to Sharia law), which could be used to blackmail them if necessary. The spies were to find out as much as possible about the target towns: Who lived there, who was in charge, which families were religious, which Islamic school of religious jurisprudence they belonged to, how many mosques there were, who the imam was, how many wives and children he had and how old they were. Other details included what the imam’s sermons were like, whether he was more open to the Sufi, or mystical variant of Islam, whether he sided with the opposition or the regime, and what his position was on jihad. Bakr also wanted answers to questions like: Does the imam earn a salary? If so, who pays it? Who appoints him? Finally: How many people in the village are champions of democracy? The agents were supposed to function as seismic signal waves, sent out to track down the tiniest cracks, as well as age-old faults within the deep layers of society — in short, any information that could be used to divide and subjugate the local population. The informants included former intelligence spies, but also regime opponents who had quarreled with one of the rebel groups. Some were also young men and adolescents who needed money or found the work exciting. Most of the men on Bakr’s list of informants, such as those from Tal Rifaat, were in their early twenties, but some were as young as 16 or 17. The plans also include areas like finance, schools, daycare, the media and transportation. But there is a constantly recurring, core theme, which is meticulously addressed in organizational charts and lists of responsibilities and reporting requirements: surveillance, espionage, murder and kidnapping. For each provincial council, Bakr had planned for an emir, or commander, to be in charge of murders, abductions, snipers, communication and encryption, as well as an emir to supervise the other emirs — “in case they don’t do their jobs well.” The nucleus of this godly state would be the demonic clockwork of a cell and commando structure designed to spread fear. From the very beginning, the plan was to have the intelligence services operate in parallel, even at the provincial level. A general intelligence department reported to the “security emir” for a region, who was in charge of deputy-emirs for individual districts. A head of secret spy cells and an “intelligence service and information manager” for the district reported to each of these deputy-emirs. The spy cells at the local level reported to the district emir’s deputy. The goal was to have everyone keeping an eye on everyone else. Those in charge of training the “Sharia judges in intelligence gathering” also reported to the district emir, while a separate department of “security officers” was assigned to the regional emir. Sharia, the courts, prescribed piety — all of this served a single goal: surveillance and control. Even the word that Bakr used for the conversion of true Muslims, takwin, is not a religious but a technical term that translates as “implementation,” a prosaic word otherwise used in geology or construction. Still, 1,200 years ago, the word followed a unique path to a brief moment of notoriety. Shiite alchemists used it to describe the creation of artificial life. In his ninth century “Book of Stones,” the Persian Jabir Ibn Hayyan wrote — using a secret script and codes — about the creation of a homunculus. “The goal is to deceive all, but those who love God.” That may also have been to the liking of Islamic State strategists, although the group views Shiites as apostates who shun true Islam. But for Haji Bakr, God and the 1,400-year-old faith in him was but one of many modules at his disposal to arrange as he liked for a higher purpose.